Babcock Falls is deﬁnitely worth the short hike. Pass through mixed pine and spruce forests and moist subalpine meadows to arrive at the 8 m high falls that plunge from a sandstone cliff to the sparkling pool below. Wooden boardwalks will lead a path through this unique wetland with wildflowers and fossilized logs on the way. This easy returned trip can be done in 1-2 hours and is a 2 km trip. This is property of the Ridge Riders Snowmobile Club and is open to everyone. This is a good place to stop, have lunch by the fire, and warm up if necessary. 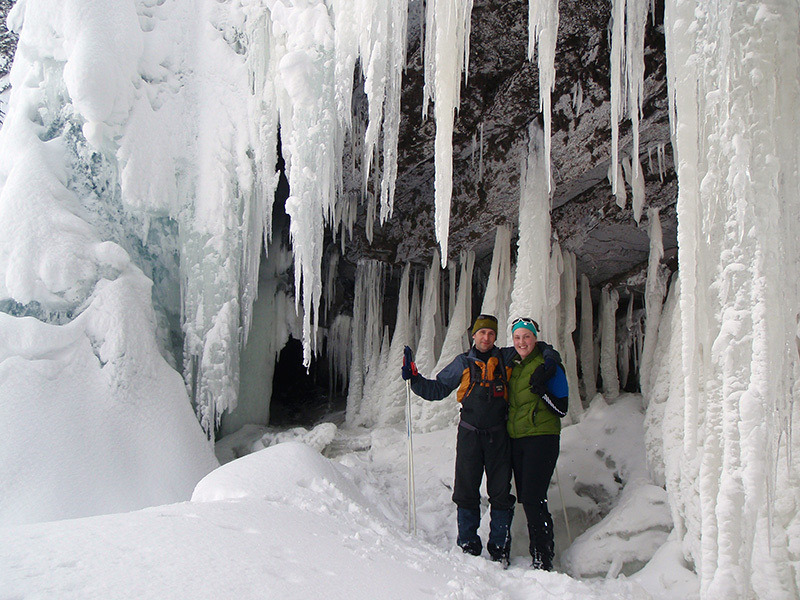 In winter months Babcock Falls is a popular destination for ice climbing. This trail is often planned at the same time as checking out the Boulder Gardens and Shipyard Titanic. The trail head begins at the Core Lodge cabin and contains rugged alpine areas with exciting climbs, bowls and steep alpine peaks. Use extreme caution and know the snow report before you set off. There are chances of avalanches, use caution. Make sure you are well equipped for back country riding – carry avalanche packs, beacons, probes, GPS, extra fuel, etc.